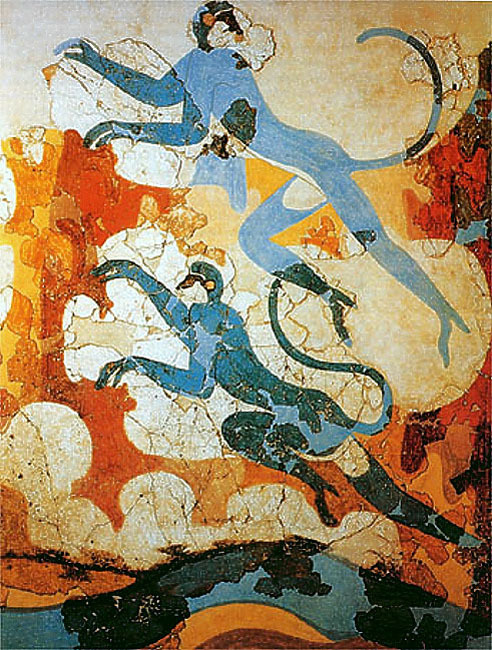 This presentation is based on the ideas expressed in my thesis "The Early Minoan Colonization of Spain" and discusses the evidence that directly associates the catastrophic fall of the Aegean El Argar culture in southeastern Iberia in about 1350 B.C. with the complex phenomenon known as the Sea Peoples that over the next 175 years would rain apocalyptic devastation on the entire eastern Mediterranean. Almost every culture in the eastern Mediterranean including the Hittites in Anatolia would become engulfed in destruction by 1175 B.C. 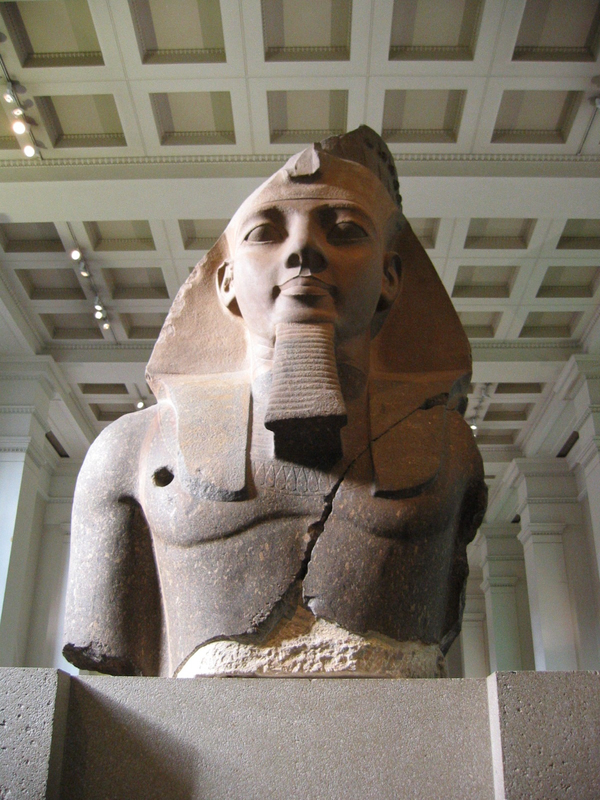 Egypt would barely survive their repeated attacks but was so severely weakened it finally collapsed later during the reign of Ramesses VI (1145 - 1137 B.C.). Only the Phoenicians in the Levant were apparently spared any destruction throughout this period. The Sea Peoples' raids and invasions from the land and sea would put an end to an era, but it was immediately followed by the "Age of the Phoenicians". Beginning with the rise of the Iberian El Argar from the ashes of the Los Millares culture this discourse hypothesizes that the peninsula was consumed in an evolving, intermittent, yet unending struggle over access to the mineral wealth of Iberia. The conflict pitted the Aegean El Argar colony with the various Beaker groups to the north and west of them. 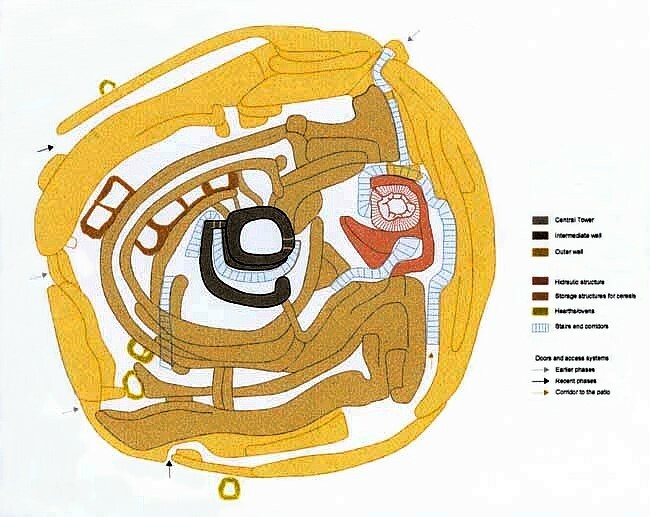 It continues with a description of how the Argaric settlements around Damiel, Spain were planned communities with highly defensible hillside villages protected by a distributed network of watchtower stone fortresses for early warning and how this same El Argar system of signaling fortresses (Motillas) began to be built on Sardinia (Nuraghes) as the conflict escalated. They would eventually grow in number to the tens of thousands and cover the entire island. 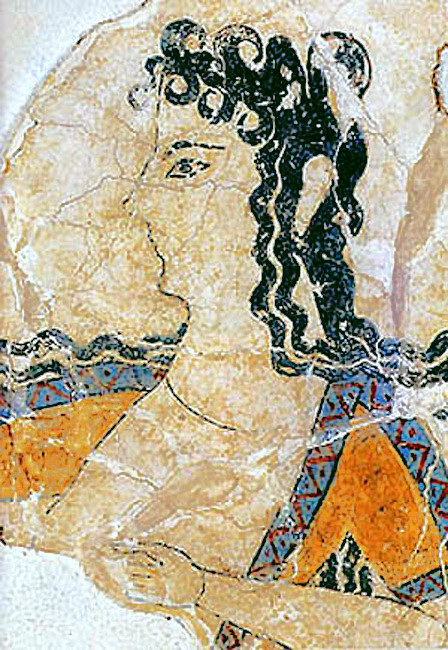 It then describes the effect of the volcanic eruption of the Theran (Santorini, Greece) volcano in the Aegean, the final period of catastrophe that spawned the El Argar Diaspora from Iberia that created the Sea Peoples, and concludes with the destruction of the Bronze Age in the eastern Mediterranean. By 2200 B.C. 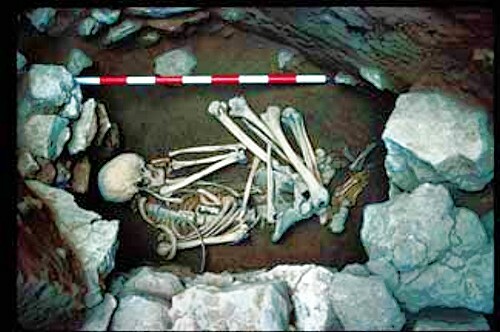 the Los Millares culture in southeastern Iberia had finally collapsed but the related El Argar culture had soon arisen to replace it. 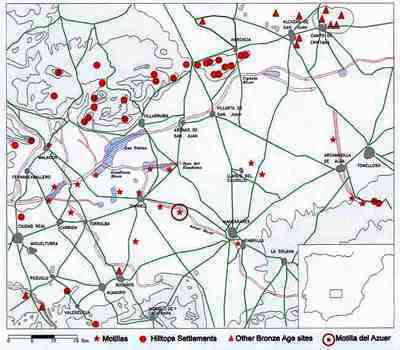 Over the next few hundred years the El Argar would spread well into central Spain much closer to the tin deposits of cassiterite ores known to exist in the Madrid and Cardenas areas. Some of these deposits are still mined today. 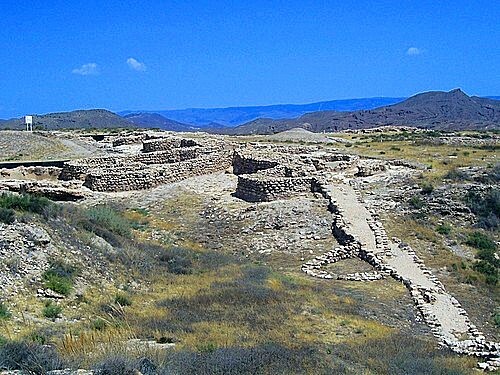 They built their fortress and defensive hillside settlements in the area around Daimiel and Manzanares in La Mancha. Daimiel is almost 250 kilometers northwest of the settlement of Almizaraque on the coast (the modern day Herrerias silver mine) but is only 150 kilometers due south of Madrid and about 110 km northeast of the Cardenas area. The area around Damiel itself is still quite rich in minerals (silver, copper, mercury, lead, etc.). The acquisition of these new lands must have been very hotly contested by the native peoples as demonstrated by the many fortress complexes found in the area. Land was scarce in the Aegean and many people may have looked on Spain as a place that had land for the taking and where one could become wealthy by finding gold or silver. The regular flow of shipping over that long period of time could have brought many tens or even hundreds of thousands of people to Spain from the Aegean. With the establishment of the El Argar settlements around Daimiel they began to build a new type of stone watchtower fortress complex; something that had never been seen before then. The Motilla Del Azuer is one of these and is currently being excavated by the University of Granada. The site is named after the small nearby town of Azuer. 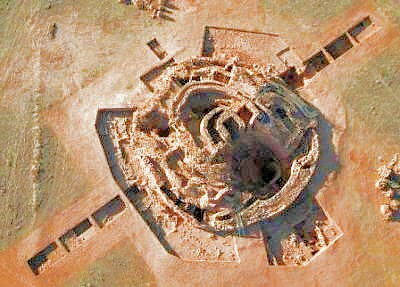 It is a circular roughly-worked structure about 50 meters in diameter that was built using Aegean tholos construction techniques. It consists of a central tower, concentric walled enclosures, and a large courtyard. There were nearly 20 of these structures built on the La Mancha plain between 2200 and 1500 B.C. when they were finally abandoned. During this time many fortified settlements existed in the area especially in the hills to the north. The courtyard sheltered a permanent source of fresh water - a 16 meter deep well. The structure's interior chambers were used for the processing and storage of grain, the production of pottery, and the housing of domesticated animals like sheep, goats, and pigs. 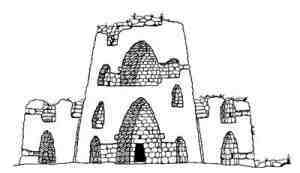 It had vaulted, circular and oval ovens built of stone and mud for cooking. The site was a complete community with a necropolis and many dwellings for the people living in and around it. The fortresses have the rough look of being built quickly. 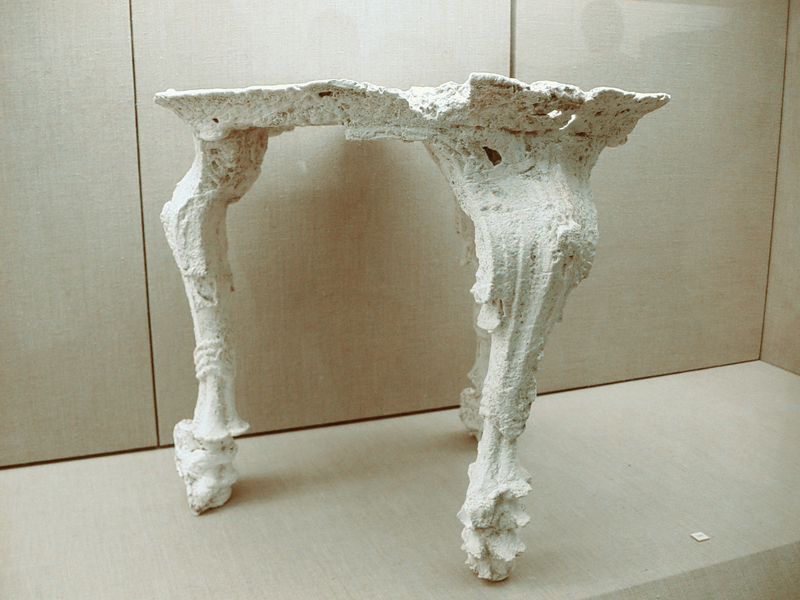 There was little consideration given to smoothing the stone for aesthetic appearance. Functionally seems to have been the only concern of the builders. The outer walls of the fortress are inclined inward towards the interior and its ovens were vaulted. 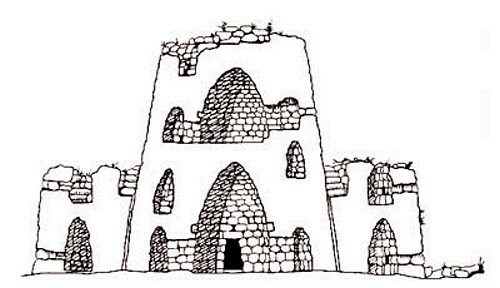 This implies they were built using the same techniques employed when building corbelled (inward sloping tholos-like) walls that join at the top to create interior space. 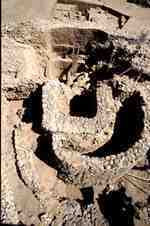 This was a common stone construction technique of the Los Millares and El Argar people. The primary structural component of the Motilla is its central tower. The roughly circular stone structure is about 10 or 11 meters in diameter at its base and has two interior chambers on its lower level. The upper levels of the tower no longer exist, but narrow ramps led up to its upper levels. Each of the tower fortresses was placed equidistantly on the La Mancha plain with a separation of about four or five kilometers and within line-of-sight of each other. From this, one can reasonably assume that they were watch and signaling towers. Collectively, they were an early warning system for intruders moving onto the plain. Once danger was sighted, a fire could be lit on top of a tower to relay the danger signal to its adjacent towers. The entire area of over 2,000 sq. kilometers could be alerted to any approaching danger very quickly. These were self-contained fortress communities that enabled relatively few well-prepared people to withstand an attack by a much larger force considering the weapons of the day. They provided the defenders with a permanent source of fresh water and the food storage capacity to withstand a long sustained siege. If they were signaling towers and used fires on the tower's top for this purpose, the roof was most probably constructed of stone and not wood. This assumes a generally flat stone top surface with, perhaps, low parapet walls. From the outside this is a truncated cone structure. Strikingly, this is same primary structural component of the tholos nuraghes that began to be built in Sardinia in about 1750 B.C. (Kolb 2005). 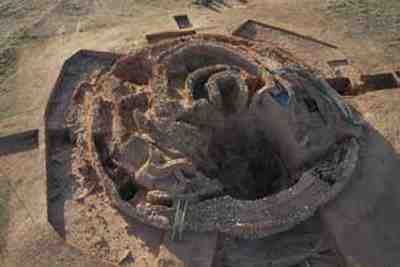 This was hundreds of years after the first tholos motillas were built in Spain. 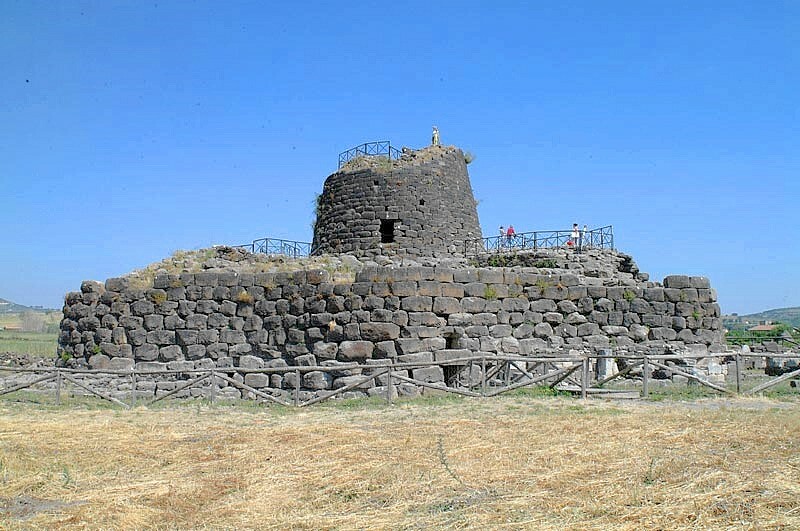 All of the tholos nuraghes on Sardinia including the ones at Barumini, Santu Antine, and Palmavera employ stone watchtowers that are functionally and structurally identical to the Motilla Del Azuer in Spain and use the same rough-hewn Aegean tholos-like (beehive) stone construction techniques. It is estimated that there were once over 30,000 of these watchtowers spread all over Sardinia and there are still some 7,000 that can be seen on the island today. 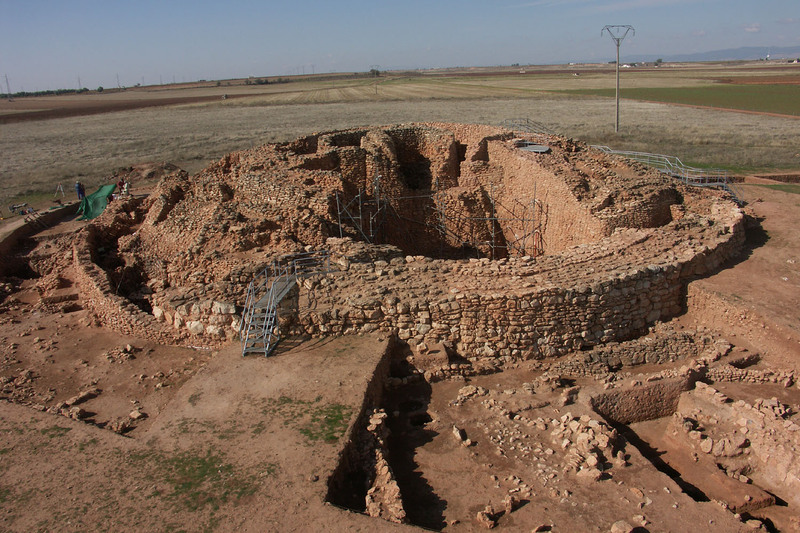 There are many other stone watchtower tholos structures that appeared in the western Mediterranean at about the same time the Motilla del Azuer was abandoned in 1500 B.C. They are in southern Corsica with the Torreenne Civilization (ex: Arragio and Torre near Porto-Vecchio), in the Balearic Islands (Talaiots), the islands north of Sicily - Paneria and Isola Filicudi, and on the volcanic island of Pantelleria (Sesi) south of Sicily. But I have not been able to find any of these structures in Italy from this time or elsewhere in the western Mediterranean. There is a great deal of evidence of an enduring and profound struggle for the land between the indigenous people and the Millarens from the very beginning of the colony's existence. It consists mainly of the many stone fortress structures built by the Aegean settlers to protect themselves: from the hill fort at Los Millares to the Motilla Del Azuer of the El Argar. Some form of fortress or defensive structures were used throughout the period of the Millarens to the end of the El Argar period in around 1350 B.C. During this long time of over 2,000 years there must have been long periods of relative peace that promoted the mixing and exchange of the populations. The lingering tensions existed but the hope for and the confidence in a sustained peace may have been strong on both sides at times until they were shaken by external events. One of these events was the fall of the Los Millares culture in about 2200 B.C. when the evidence indicates that the Aegean Minoans began to greatly expand the colony's population with waves of new settlers that created the El Argar civilization. This may have been done to secure their position in Iberia and in preparation for a new push of expansion aimed at taking the tin mines of Madrid and Cardenas in central Spain militarily. If a conflict was responsible for the fall of the Millarens it would have been with the Beaker groups that bordered them. As the El Argar came onto the scene these same Beaker groups must have been defeated in turn and forced from some of their lands. This may have spawned the demons of continual war with the Iberian Beaker Groups and heightened the level of bloody conflict greatly. With this possible scenario there would have come a time when the El Argar settlers began to take to their ships and emigrate in search of other more hospitable places to live throughout the Mediterranean and Europe, but it seems especially on the island of Sardinia because of the considerable architectural evidence of Motilla construction on the island. 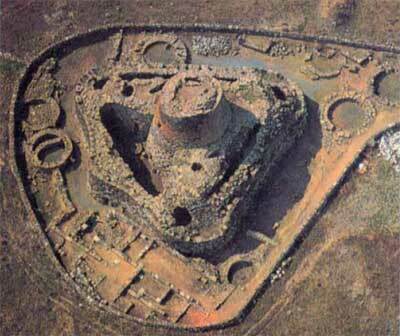 The first Aegean El Argar watchtower fortresses (Tholos Nuraghes) appear in Sardinia sometime after 2000 B.C. 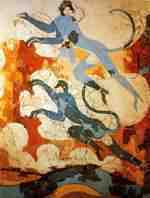 When the Minoan El Argar made there first moves at conquest after 2200 B.C. it may have initiated a spirit of resistance from the native Beaker peoples that dragged the entire area into an unrelenting conflict that lasted until the bitter end with the catastrophic defeat and utter collapse of the El Argar in about 1350 B.C. This struggle could have been a very ugly affair indeed. The various Beaker peoples from all over Spain, Portugal, and the peoples to the north (Europe and British Isles) may have joined in a war to destroy the invading colonial aggressors. It may have degenerated into a people's war of annihilation like the one Germany and the Soviet Union fought in World War II; filled with hatred and atrocities. The Theran Eruption severs Spain's Aegean connection - 1630 B.C. 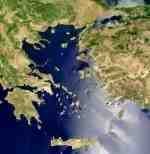 When the Theran (Santorini) volcano exploded in the Aegean in about 1630 B.C. it must have disrupted and affected the shipping route to Spain for possibly several years. 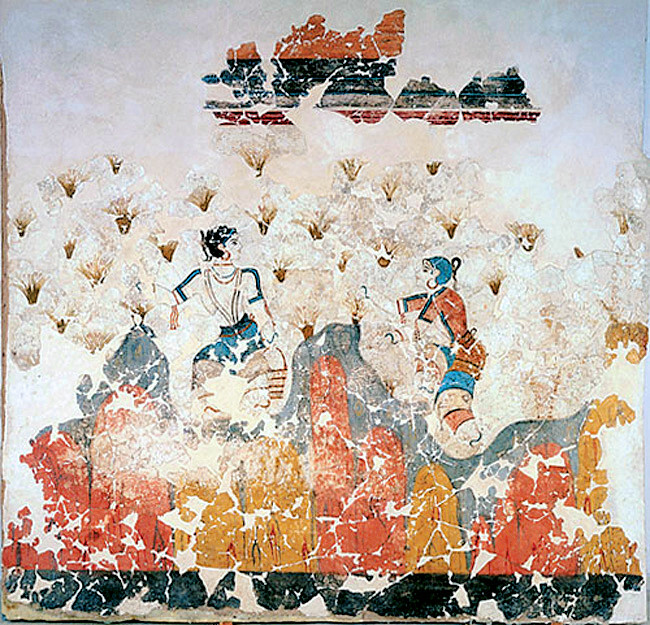 It would have been difficult enough for the surviving Minoans to resurrect the eastern Mediterranean trade routes amid the incredible devastation. 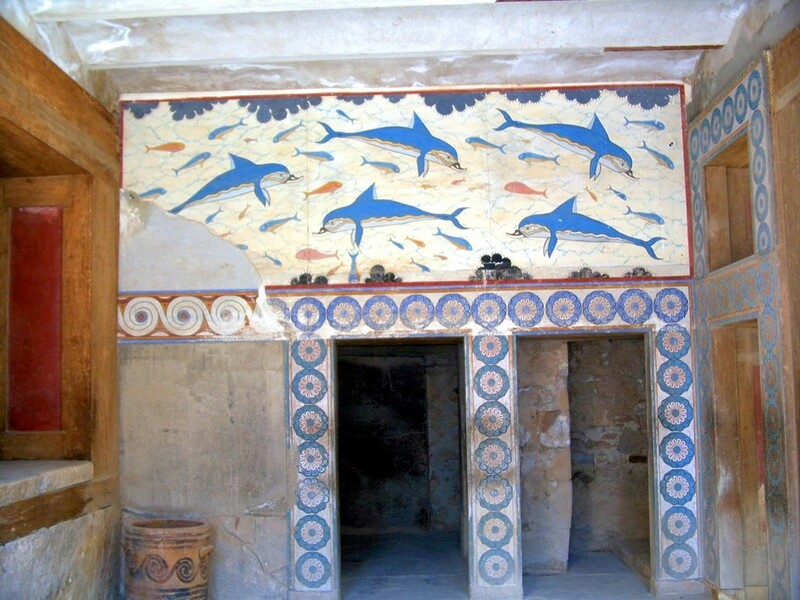 The effective Minoan policing of the old trade routes from piracy that was in place before the eruption may have never again been achieved. The western Mediterranean shipping lanes might have had to wait for enough new ships to be built after the eastern Mediterranean trade routes were able to start up again. The colonists were cut off from their eastern motherland and may have been on their own in the middle of a war. The colonists could have been in a period of intense fighting when the ships inexplicably stopped coming and didn't return. They would have felt abandoned and insecure that their lifeline was gone and they would have to fight the possibly huge and growing Beaker alliance without reinforcements from the Aegean. Once the Beaker alliance's leadership learned of the colony's break in support from the Aegean they may have felt heartened and increased the pressure on the colony with a belief that now eventually they were going to win. The colonial leadership could have begun to look for other places to settle in the region in case the war turned against them. These considerations would have driven them to construct their own ships. The Beaker alliance may have had a technological advantage in that they had easy access to the tin in western Spain and the British Isles and copper was readily available. They could have cheaply made the finest bronze weapons. The colonists may have been reduced to fighting with weapons of inferior arsenical copper if their supplies of tin became restricted. 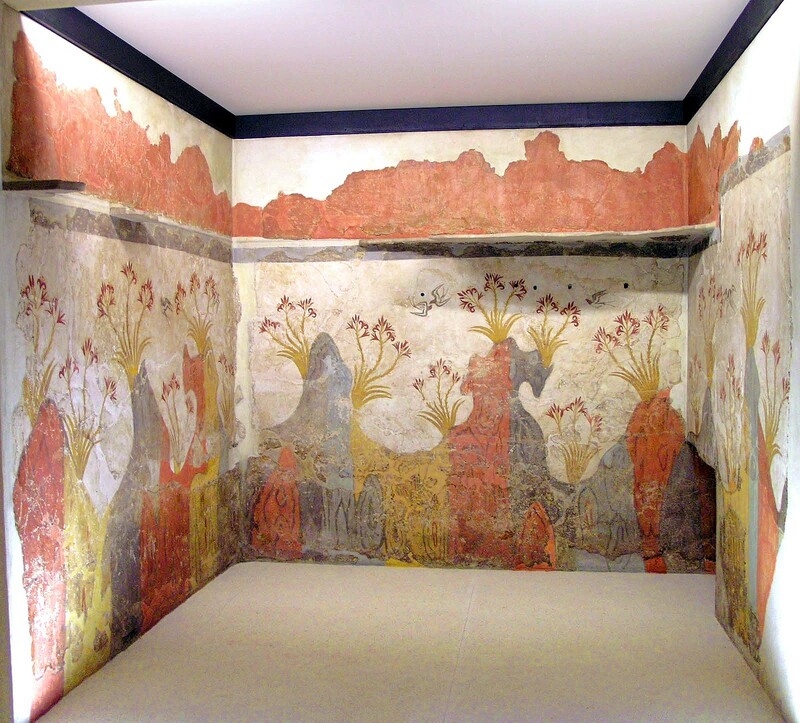 Another disruption probably occurred during the war which ended in the conquest of the Minoans in the Aegean by the Mycenaeans about 50 years after the Theran eruption. Perhaps one day in about 1580 B.C. a great Mycenaean fleet landed on the coast near the modern town of Garrucha to demonstrate the king's power over all those that lived in the colony. 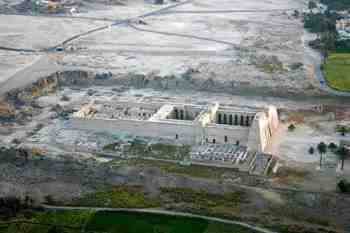 The capital of El Argar was only ten kilometers inland. The Mycenaean takeover of El Argar might have been quite tricky and problematic. The king would have wanted the mineral treasures of Spain to be shipped to Mycenae as soon as possible with as little trouble as possible. The colonists may have been desperate for reinforcements at the time and still felt very much dependent on the Aegean for support in a perpetual war. This second disruption would have further pushed them to believe that help from the Aegean could not be relied on and forced them to look at the world as an independent people in need of securing their own destiny. Many of the colonists may have been resistant to the takeover of the colony's leadership by the Mycenaeans and looked for other lands to settle in. 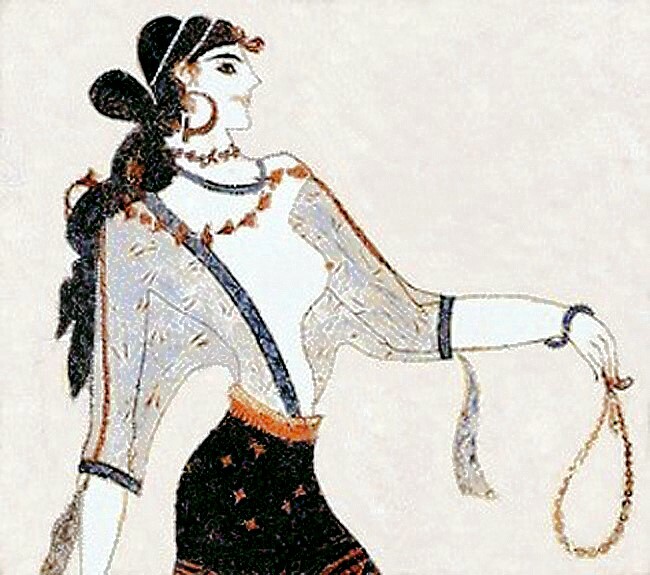 The Minoan policy of colonial expansion was hundreds of years old when the Mycenaeans took control. 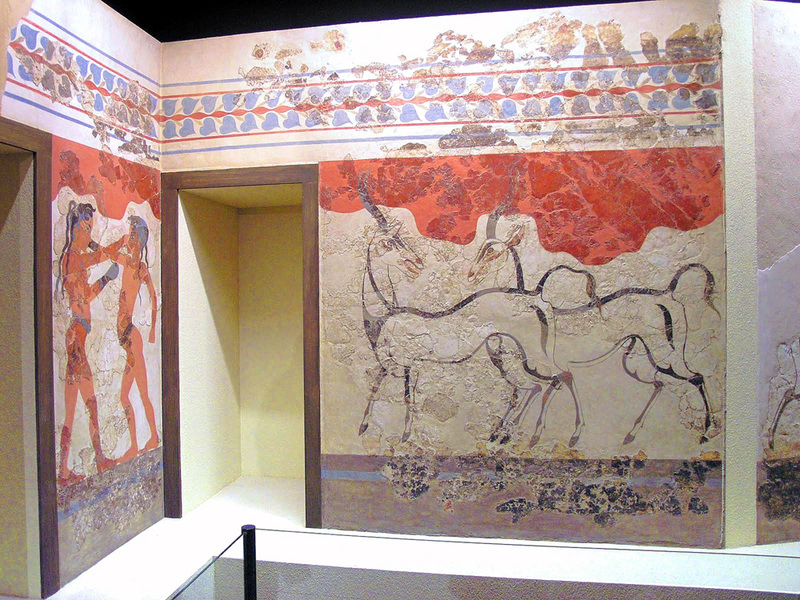 The Mycenaean controlled El Argar colony lasted until about 1350 B.C. when evidently they were finally defeated by the great alliance of Beaker peoples united against them. If it was a people's war then the side with the larger number of warriors with the greatest resources and determination would eventually win out in a prolonged war of attrition. The El Argar and their Bronze of Levante allies had for a time increased the lands under their domain until the tide finally turned against them and things began to go badly. There may have been a great influx of warriors into Spain from Europe and the British Isles to help fight the Aegean aggressors. 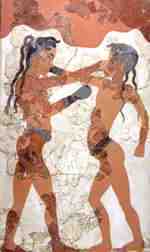 The Minoan colonial leadership may have been less brutal than the Mycenaeans that succeeded them. If the Mycenaean king at the time was as brutal as Agamemnon was at the sacking of Troy then the now Mycenaean war of expansion might have become quite savage indeed. It is likely the emigration of colonists by sea from Spain to Sardinia and other places in the area would have grown with these events. 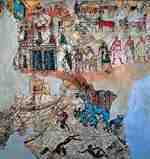 The El Argar Diaspora and the Birth of the Sea Peoples ~ 1350 B.C. The Mycenaeans may have accelerated the immigration of warriors and settlers to Spain with people from all over the Aegean for a time. But at some point after the war turned against them the colonists must have looked at their options for resettlement if they were facing eventual defeat. If it was a people's war, defeat may have meant death or worse. As emigration from the colony increased and the war pushed them toward the coast they were possibly blocked from northern migration by the Urnfields. Their only avenue of escape was the sea. After being in existence for over 2,000 years and experiencing several waves and flows of immigration, the number of displaced colonists that emigrated or were expelled from Spain may have been, at least, in the hundreds of thousands or more. 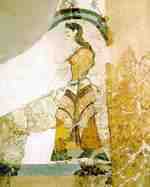 The Minoan Diaspora from Spain gave birth to the Sea Peoples. They would have ventured out into the Atlantic to make their way to settle in the British Isles and northern Europe and they would have traveled to any lands in the east that were too weak to resist them. They settled throughout the western Mediterranean, especially in Sardinia, and into the eastern Mediterranean on the coasts of southwestern Turkey and North Africa west of the Nile delta. 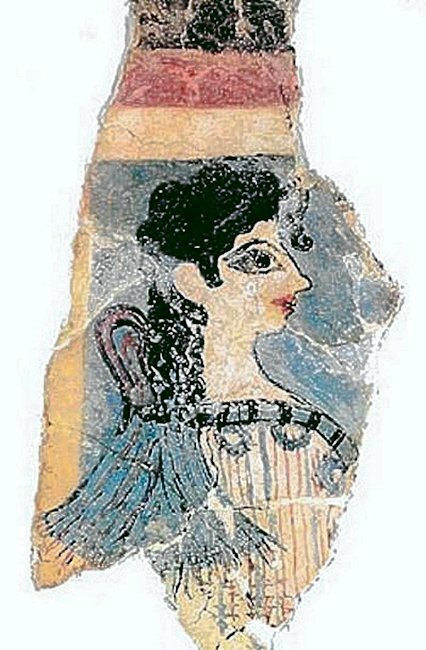 The original Minoan colonists from Spain had returned to the eastern Mediterranean but not in a way anyone could have ever envisioned. They probably had only what they could carry and life must have been very difficult as they struggled to find a new place to live on their ships. The Mycenaeans began to build the Cyclopean wall defenses at Mycenae at about the same time as the final collapse of El Argar in Spain. The disastrous war in Spain may have weakened them militarily and being cut off from its mineral wealth may have seriously hurt them economically. The walls might have been built in response to the first raids of the Sea Peoples. 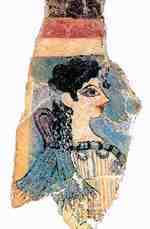 The Mycenaean King may not have been held in high repute by the exiles. 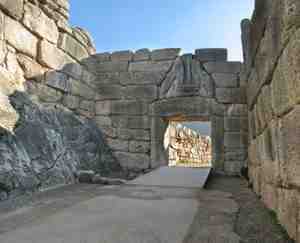 They could have felt betrayed and abandoned by him and considered Mycenae a high target for retribution. Could it have been the weakening of the Mycenaean economy because they were no longer receiving Spain's gold and silver and the desperation for wealth that prompted Agamemnon to launch his alliance of a thousand ships in about 1300 B.C. to take the plunder of Troy VI? While the taking of the wealth of the Trojans would have been quite a coup, perhaps Agamemnon's greater ambition was to eliminate the one and only city-state that blocked his unhindered maritime access from the Aegean to the known gold and silver resources in the Black Sea area. Gold was available among the Colchis, of Jason and the Argonauts fame, in the east and gold and silver was to be gained in the Balkans to the west. He was never able to follow through with any possible future ambitions because he was murdered in a plot masterminded by his wife Clytemnestra and her lover Aegisthus after his return from Troy. The first recorded mention of the Sea People is in the Amarna letters dated at about 1345 B.C. 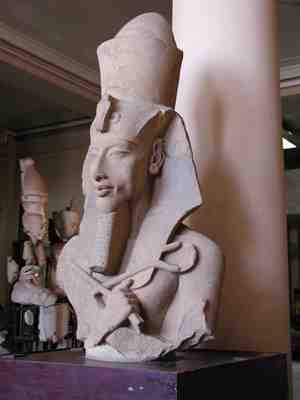 during the reign of Akhenaton (1353 - 1336 B.C.) in Egypt. A people called the Shardana (Sardinia) are described as raiders and mercenaries and helped to man the Egyptian garrison at Byblos in Phoenicia in the service of its mayor. A people called the Lukka (southwestern Turkey) are accused of attacking the Egyptians and raiding and seizing Alashiyan (Cyprus) villages. The Danuna people (?) are mentioned with a reference to the death of their king. 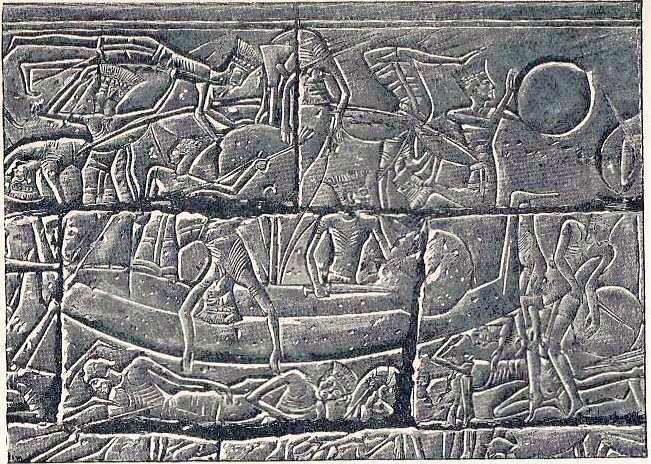 The Invasions of the Sea Peoples - 1278 to 1175 B.C. 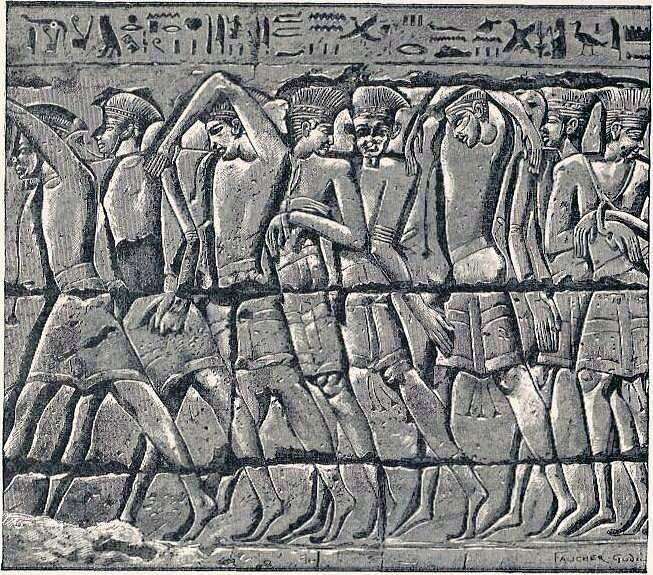 The next recorded appearance of the Sea Peoples is from the Tanis Stele II that describes a sea battle with the Egyptians in 1278 B.C. 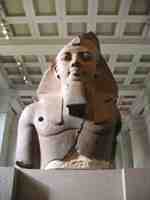 under the pharaoh Ramesses II who reigned from 1279 to 1213 B.C. 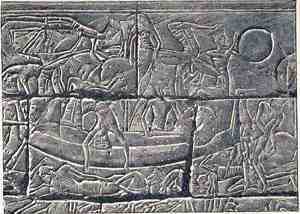 The Sea Peoples mentioned are the Shardana, Lukka, and Shekeleshu (Sicily?). The Sea Peoples must have greatly desired the fertile farmlands of the Nile delta. 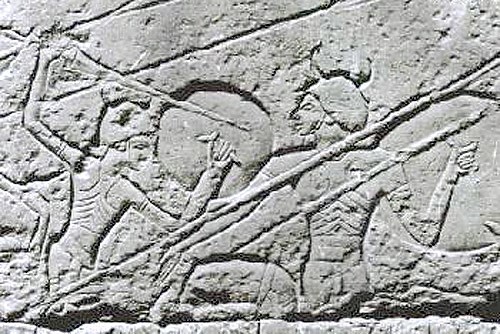 The attack ended in their defeat and captivity with many being incorporated into the Egyptian military to defend their northern border with the Hittites. 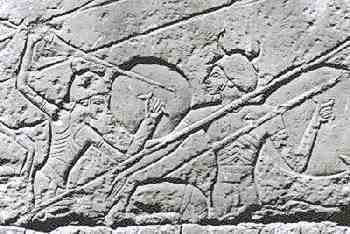 In 1274 B.C., after defeating the Syrians and their Levant allies the previous year, the Egyptians clashed with the Hittites and their allies at the Battle of Kadesh in modern Syria. The Karnak Inscription says the Shardana captured a few years earlier were in the service of the Egyptians and helped fight an alliance of the Hittites, Kheta (Syrians), Lukka, Karkisa (southwestern Turkey), and other Levant allies. The land battle was inconclusive and in 1258 B.C. 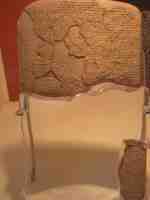 the Hittites and the Egyptians agreed to the first recorded peace treaty. 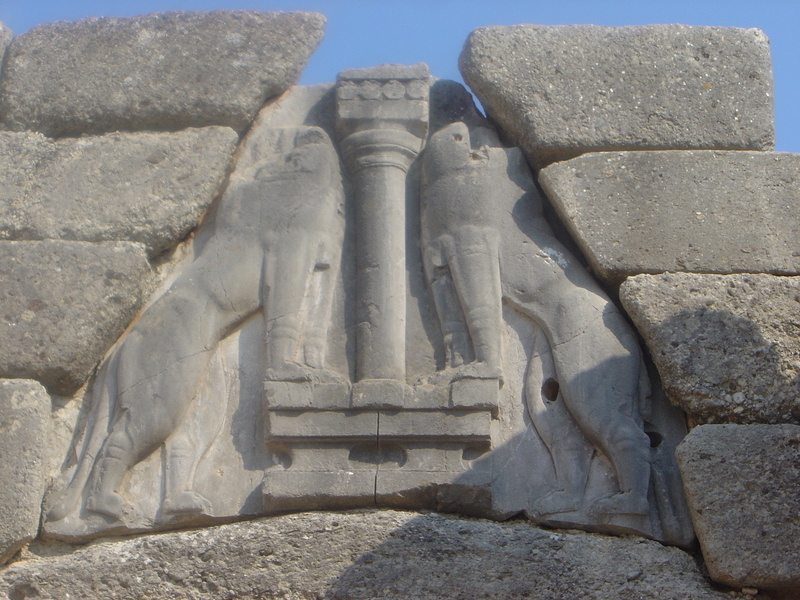 The Lion's Gate and the Treasury (Tholos Tomb) of Atreus were built some one hundred years before the first large scale destruction of Mycenae by the Sea Peoples in about 1250 B.C. A few decades later during the reign of Merenptah (1213 - 1203 B.C.) the Sea People's Nine Bows Confederacy under the leadership of King Meryey of Libya attacked Egypt's western Nile delta at the Battle of Perire in 1208 B.C. Their wives, children, and belongings accompanied the King and his warriors in their march toward Egypt with the obvious intention of settling permanently in the delta region. 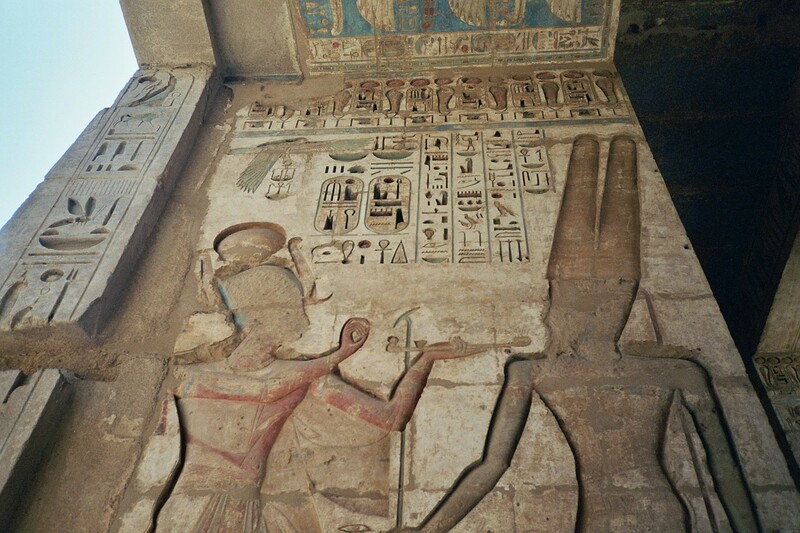 The Great Karnak Inscription tells of the defeat of the coalition under King Meryey after six hours of fighting. The coalition included the Libyans, Ekwesh, Teresh, Lukka, Shardana, Shekelesh, Meshwesh, and Northerners coming from all lands. 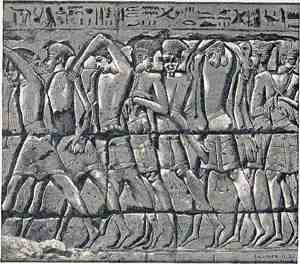 The Egyptians describe the Sea Peoples defeat as a slaughter with the killing or capture of some 9,376 of them. The majority of these were Libyans but also included 2,201 Ekwesh, 742 Teresh, and 222 Shekelesh. The numbers for the other members (Lukka, Shardana, Shekelesh and Meshwesh) of the coalition are missing. Those killed and captured were probably only a fraction of the true size of the army because King Meryey was not captured and returned to Libya. 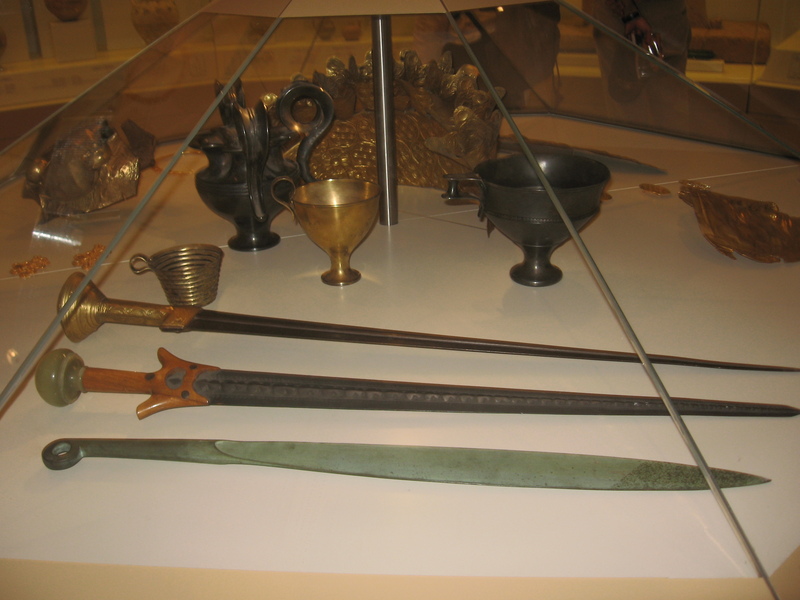 The Egyptians captured 9,111 copper swords, cattle, goats, fine vessels, armor, and a variety of other weapons. Notably, the swords are described as being made of copper and not bronze. Also, the Ekwesh are described as being without foreskins. 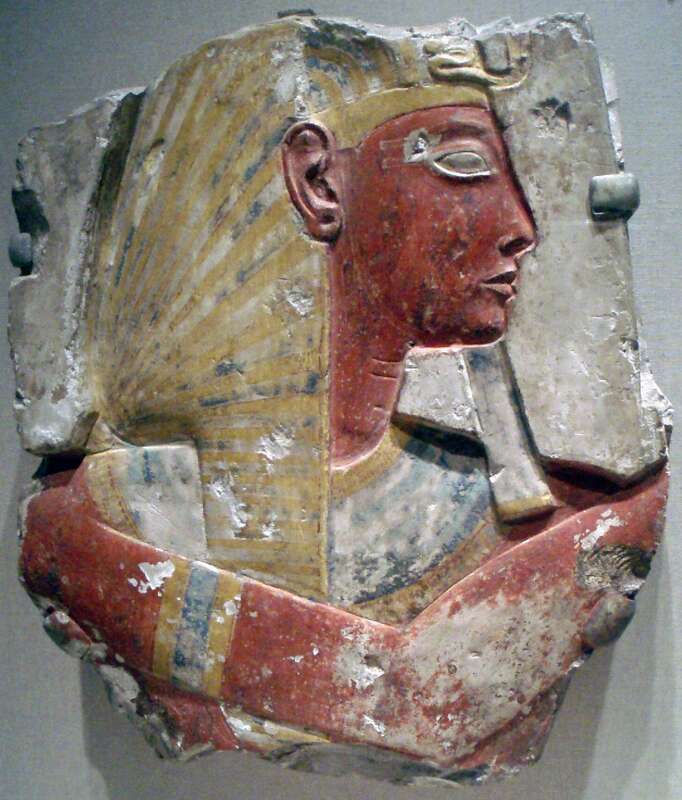 During the reign of Ramesses III (1186 - 1155 B.C.) the Sea Peoples burned every major city from Troy VIIA in northwestern Anatolia to Gaza in the southern Levant with the notable exception of the Phoenician cities of Arwad, Berut, Byblos, Sarepta, Sidon, and Tyre in the Levant. Egypt was attacked at least three times during this period. 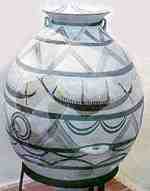 The first incursion occurred in 1180 B.C. when the Libyans again attempted to seize the Nile delta, but it again ended in failure. In about 1178 B.C. 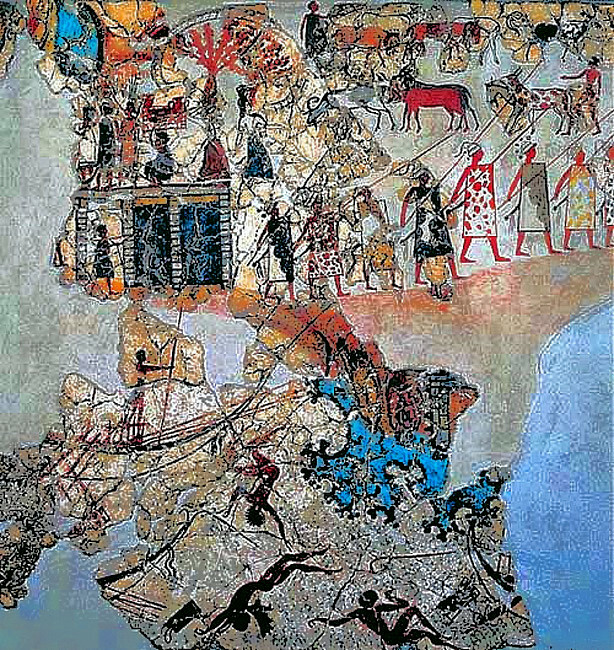 the Sea Peoples launched a combined land and sea invasion that resulted in the land "Battle of Djahy" in Canaan and the sea "Battle of the Delta". The Egyptians were again victorious but terribly weakened. 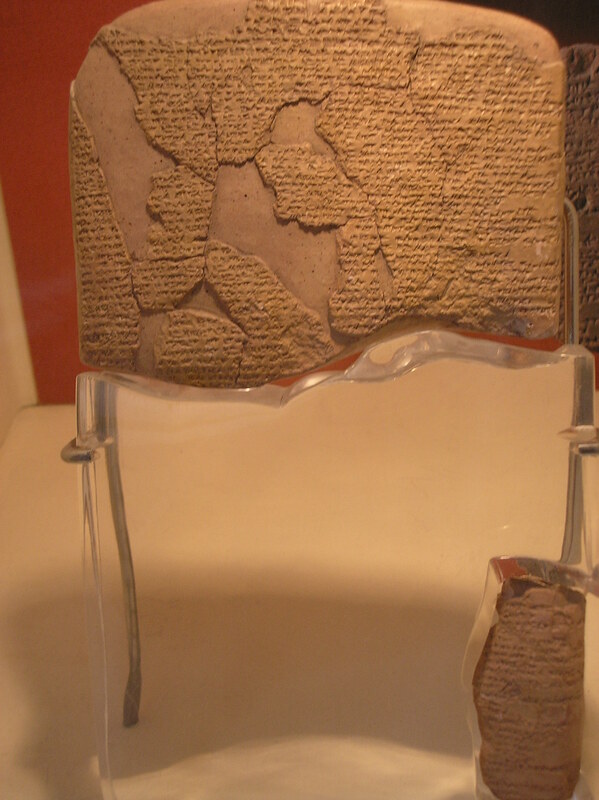 According to the Papyrus Harris the confederation included the Peleset, Tjekker, Shardana, Danuna, and Weshesh. The Shardana and Weshesh are described as being "of the sea" implying they are wandering sea-farers that were raiders and pirates. The Mortuary Temple of Medinet Habu states the coalition facing him was composed of the Peleset, Tjeker, Shekelesh, Denyen, and Weshesh. By this time, after over 100 years of chaos in the eastern Mediterranean created by the Minoan Diaspora from Spain, the trade routes were shattered and the whole region was impoverished and desperate for survival. The Report of Wenemdiamun is a priceless piece of illumination into the true nature of the makeup of the Sea Peoples at this time. Notably the Papyrus Harris tells of the captured Sea Peoples as being resettled in strongholds. 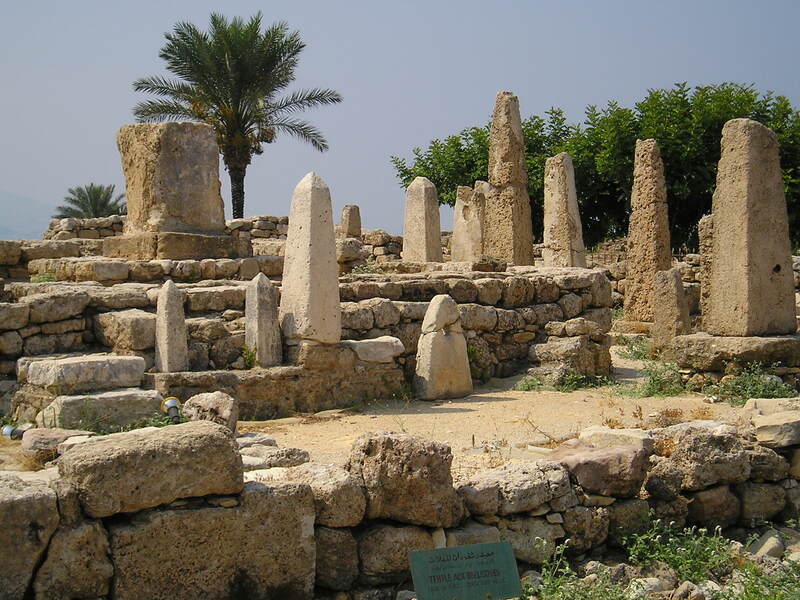 These strongholds were probably the founding settlements of the Philistines in Canaan. The final attack came in 1175 B.C. when the Libyans attacked the Nile Delta again with the same result. The Egyptians won the battle but their resources were dangerously exhausted. They would never fully recover from this era of conflicts with the Sea Peoples and would later collapse during the reign of Ramesses VI (1145 - 1137 B.C.). 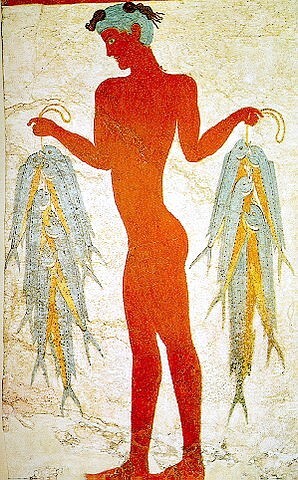 By this time all of the great Bronze Age powers that had existed before the volcanic eruption of Minoan Santorini, except the Egyptians, lay shattered, depopulated, and would never recover. In sharp contrast, the Phoenicians in the Levant survived completely unscathed and invigorated. 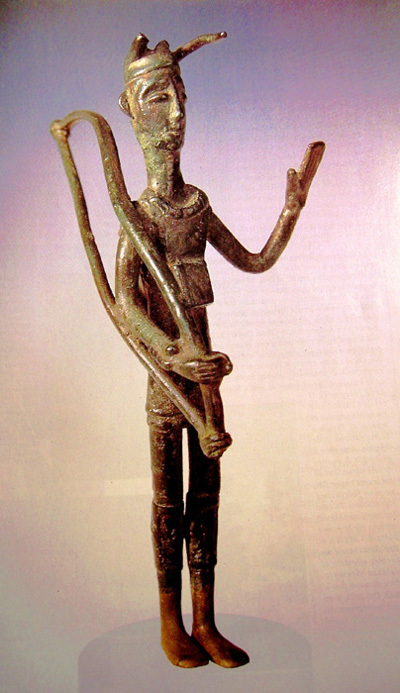 It was the beginning of the "Age of the Phoenicians" in the Mediterranean. What did they do? They headed straight for the gold, silver, and tin of southern Iberia to establish trading outposts and colonies. Bibliography: F. Molina, T. Najera, G. Aranda, M. Sanchez, and M. Haro. 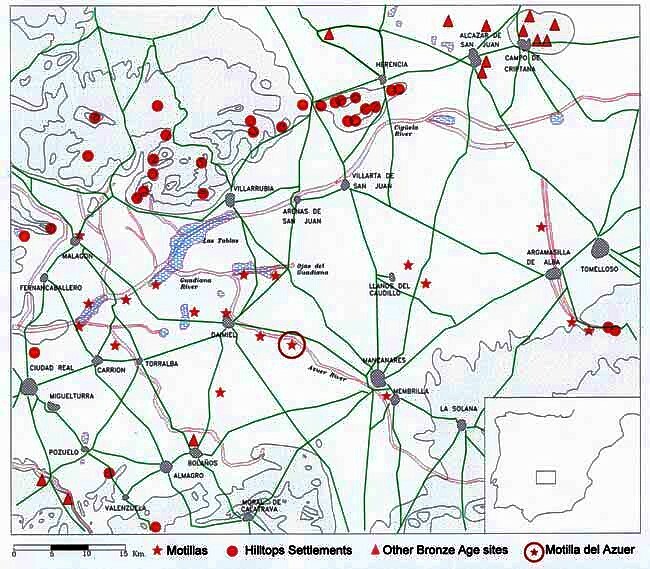 "Recent fieldwork at the Bronze Age fortified site of Motilla del Azuer (Daimiel, Spain)". Department of Prehistory and Archaeology. University of Granada. Antiquity Vol 79 No 306 December 2005. Rutter, Jeremy B. 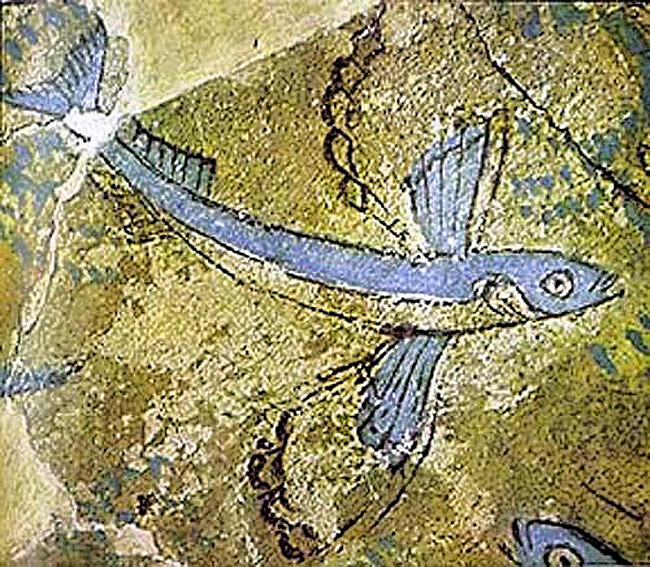 "Aegean Prehistoric Archaeology". Dartmouth College. Michael J. Kolb. The Genesis of Monuments among the Mediterranean Islands In: The Prehistoric Archaeology of the Mediterranean. Edited by B. A. Knapp and E. Blake. Blackwell, London, pp. 156-179, 2005. Yener, K. Aslihan. 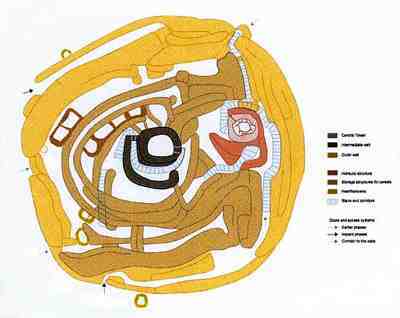 "An Early Bronze Age Tin Production Site at Goltepe, Turkey". The Oriental Institute and the Department of Near Eastern Languages and Civilizations. University of Chicago. A. Salimbeti. "The Greek Age of Bronze: Sea Peoples". 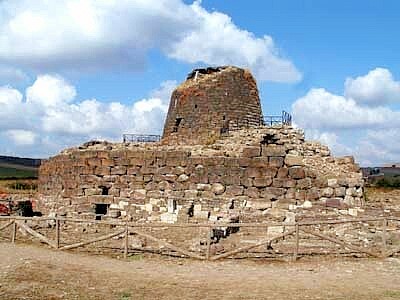 Santu Antine Nuraghe, Sardinia. The Megalithic Portal. Many Viking Yacht enthusiasts sailing the Mediterranean today may not know about the Sea Peoples and the effect they had on Late Bronze Age societies. Studying some Mediterranean history before looking at the newest Viking Yachts for sale will help boaters understand the archaeological sites throughout the area.